Taipei, March 24 (CNA) Several city councilors have reiterated demands from a day earlier for Kaohsiung Mayor Han Kuo-yu (韓國瑜) to reveal what he and Beijing's top official in Hong Kong discussed Friday, saying it was a basic responsibility of a government official. Han met with Wang Zhimin (王志民), the director of the Chinese Liaison Office of the Central People's Government in the Hong Kong Special Administrative Region (LOCPG HK), at the liaison office Friday evening and was invited to a dinner reception by Wang. The meeting was not included in the itinerary of Han's seven-day tour of Hong Kong, Macau, Shenzhen and Xiamen that began Friday put out by Han's office prior to the trip, and it was harshly criticized by the ruling Democratic Progressive Party (DPP) on Saturday. DPP officials, including President Tsai Ing-wen (蔡英文), branded the LOCPG HK as a symbol of China's imposition of the "one country, two systems" formula in Hong Kong, and questioned whether Han was helping China promote the system for Taiwan. At a press conference Sunday at the Legislative Yuan, several city councilors called on Han to reveal what happened at the meeting, arguing that Taiwan's sovereignty could not be sold out. Taichung City Councilor Huang Shou-da (黃守達) of the DPP reiterated the party's stance that the liaison office was responsible for the "one country, two systems" formula in Hong Kong and that Han's visit was tantamount to his support and push for the formula. He said political parties in Taiwan are now busy setting up primaries to nominate candidates for the 2020 presidential elections, but that the Chinese Communist Party (CCP) has already selected Han Kuo-yu as its preferred candidate. Another DPP city councilor from Taipei, Wu Pei-yi (吳沛憶), said several of Taiwan's political leaders, including former President Ma Ying-jeou (馬英九), have had exchanges with Hong Kong's government in the past few years, but none of them entered the Chinese government's liaison office in Hong Kong. Han has said his trip is aimed at promoting trade, but Wu questioned that, noting that under Hong Kong's Basic Law, developing trade and economic ties with Taiwan comes under the Hong Kong government's jurisdiction and is unrelated to the LOCPG HK. Han should make known what he talked about with Wang during the meeting, Wu said, a demand similar to that made by Taiwan's Mainland Affairs Council a day earlier. 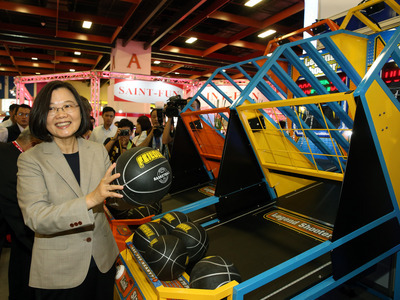 The Kaohsiung mayor responded after arriving in Macau on Saturday, saying that there was no way he would sell out Kaohsiung under the watchful eyes of his wife, the deputy mayor, and 10 other city councilors who are all accompanying him on the trip. He was also cited by Apple Daily as saying that he and Wang had a pleasant conversation on topics related to family, work and the futures of Hong Kong and Kaohsiung and that it did not touch on sensitive issues. But Taipei City Councilor Miao Po-ya (苗博雅) of the Social Democratic Party said Sunday she could not understand why Han "was so happy to head to" China's head offices in Hong Kong and Macau when even the chief executives to the two regions stay away from them to avoid arousing suspicion. Miao also speculated that Han's plan to promote Taiwanese agricultural products during the Hong Kong visit was simply a pretext to get around Taiwanese law to talk with Chinese officials. She said that under the Act Governing Relations between the People of the Taiwan Area and the Mainland Area, only the government or authorized individuals and institutions can negotiate and handle China-related issues, but Han did not have authorization to do so. Despite her speculation, Miao did not say what Han may have been trying to accomplish in his meeting with Wang. DPP New Taipei Councilor Dai Wei-shan (戴瑋姍) said it was unfortunate that Han conducted exchanges with the CCP in a private meeting, adding that she was worried Taiwan's sovereignty could be compromised during his sale of Taiwan's fruit. The party has also made criticism of the "one country, two systems" formula a key plank in efforts to revive its sagging ratings since Chinese President Xi Jinping described the formula in a January speech as "the best approach to realizing national reunification."